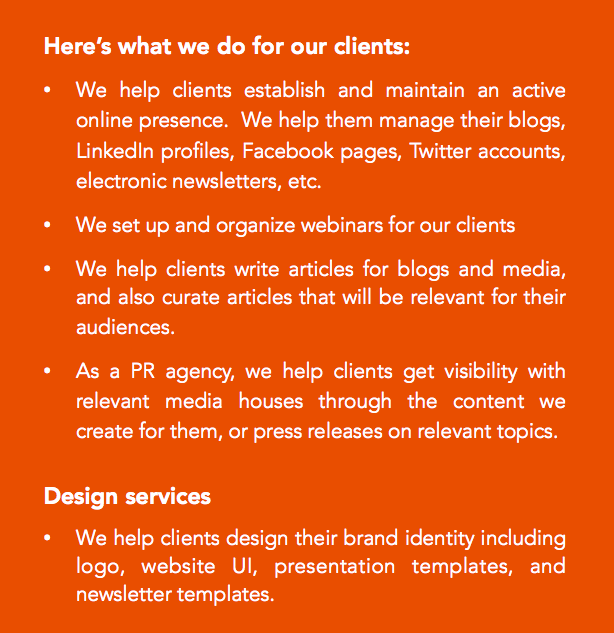 Why can’t clients do this on their own? Of course they can. It’s no rocket science. It’s just not their business to develop content and post content on online properties. Our clients find it more productive to focus on their core business, and therefore they leave the outreach and content generation and content population to us. How can content and outreach benefit your brand? Writing & posting regularly on forums relevant to your audiences and in online & print media positions a brand/person as a subject matter expert. We often assume, and most often rightly so, that a person writing content is an expert about what he/she is writing about. More than traditional PR, content driven strategy helps better establish and strengthen brand equity. Think about it. It creates a favourable perception about your brand. The online world allows you to create followers or communities that you can reach your messages regularly to. Note: Not many will visit your blog (Which was the last blog you visited?). People consume content from your blog on their LinkedIn, Facebook and online media feeds. Answering questions on relevant forums is a good way of establishing connect with potential customers. (How do we know they are potential customers? Well, why else would someone ask questions on industry forums?). Similarly, newsletters, digital magazines etc. are very efficient mediums of reaching out to potential customers with articles and content that establish your expertise and experience in your domain. And its not just customers. You get noticed by potential vendors, employees, bankers, i-bankers, investors and even media.